Fix PC Errors! Easily Scan, Repair and Increase system speed and stability by repairing corrupted registry files. Extremely effective, designed to fix Windows Errors, Registry Inconsistencies and Enhance performance of your PC. With high-performance detection algorithm that will quickly identify missing and invalid references in your Windows registry, RegistryWiseCleaner will scan your computer for these invalid system references and file references and automatically repair them. Now almost all computer problems can be resolved easily and automatically with RegistryWiseCleaner. 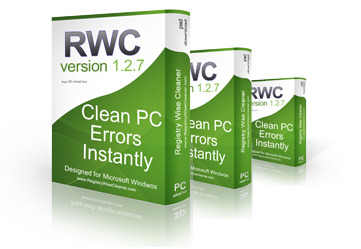 System Optimizer Speeding, optimizing and cleaning you PC is a snap with RWC. System Fixer Use this option to repair all the errors automatically with a single click. System Tools 4 useful and effective utilities on enhancing the usability and performance of your PC. Backup Compatibility Save any data, favorites and folder private information for later use with RWC. Internet Explorer Tools Use the rich built-in utilities to guarantee a better and healthier environment of your IE browser.